Guess where I'm writing from? : Dobré ráno Praha! It was a bright and sunny morning when the big K and I stepped onto platform no. 7 of the Prague main train station otherwise known as Praha Hlavní Nádraží in Czech. For a central train station, it was on the small side (no. 7 was the last platform). Certainly looks can be deceiving, entering the underground terminal we were pleasantly surprised to see how expansive the interior was. It had several levels filled with shops and restaurants. Shopping and eating! Two of my favorite things. I would never get bored in here! The other facilities inside the terminal were a grocery, 24-hour luggage storage, a spacious ticket office, ATM machines, money exchange counters and a tourist information office. 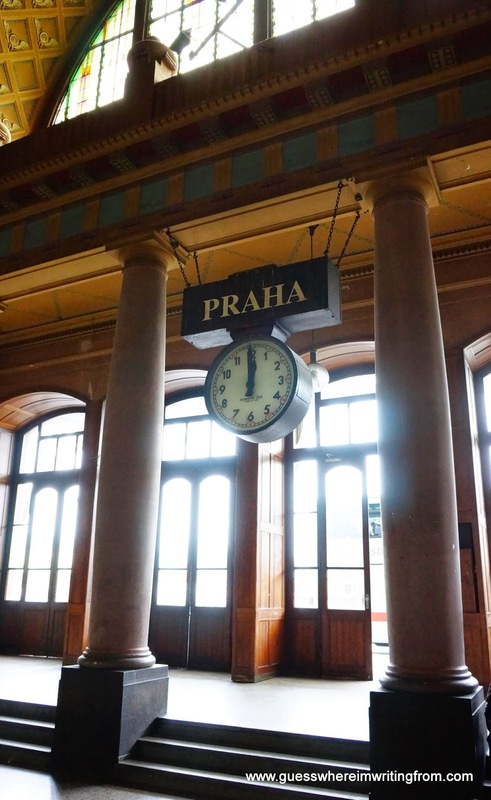 Prague central station was opened in the late 1800s. Talking about money, the big K and I needed some since we only had Euros with us. A while back I learned that it was better to withdraw Czech Korunas from the ATM machines as compared to having our Euros exchanged at any of the currency exchange bureaus. More often than not these money changers would charge high service fees and give lousy exchange rates. As luck would have it, one of the ATMs at the station was from my bank (I later found out that they had two branches in the city and several ATM machines scattered all over the place) so I didn't have to worry about non-bank withdrawal fees. Money in our pockets, we purchased both the 24-hour and 72-hour transport passes that covered the funicular, trams, metro and buses within the city. The one day pass was available at the ticket office while the longer duration pass was available at the tourist information office. Here's the Prague transport website for reference. in the middle from the tourist office has to be activated by validating it at the start of the journey. for, well, 30 minutes. We used this to get to the train station from our hotel on our last day. Passes in hand, we were good to go! Now to figure out how to get to our hotel at Náměstí Republiky (Republic Square). From the train station, we had two options: the tram or the metro. We chose the metro since it was faster and involved fewer transfers (very important if you have big bags with you!). There are only three metro lines in Prague, A (green), B (yellow) and C (red). Easy peasy! Not much of a challenge specially if you've experienced riding the metro in Paris! Metro line C running north and south of the city had a stop at the train station that would take us to Florenc, a transfer station where we could hop onto line B to take us to our stop. Clearly marked sign of the metro stops on line C with transfer stations intersecting with lines A and B.
and C (red line) will have two colors. head towards Zličín while trains from platform 2 go to Černý Most. The metro stations in Prague are user-friendly or should I say tourist-friendly. All the stations have escalators, while some also with elevators, making lugging big bags not much of a problem. Well, that is until you hit the cobbled streets. Oh, and be sure to hang on to the handrail! All Prague metro escalators seem to be stuck on hyper-drive speed.